You've read millions of good books, so what do you recommend when people ask you, "Uhh, what should I put in my brain next?" 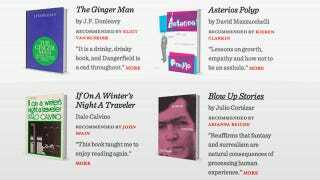 A new website, Just One Book, hosts a collection of such recommendations from interesting people. Founded by Gizmodo alums Joel Johnson and John Mahoney Just One Book contains a dozen selections, mostly from fellow writers. Being a writer isn't a prerequisite for the platform, you've just got to be able to make a convincing argument for why a particular book is so essential that you recommend it above all others. According to Uncle Joel, the duo plans to expand the project to cover movies and music down the line.